For other people named Harry Wright, see Harry Wright (disambiguation). 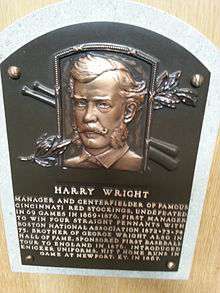 William Henry "Harry" Wright (January 10, 1835 – October 3, 1895) was an English-born American professional baseball player, manager, and developer. He assembled, managed, and played center field for baseball's first fully professional team, the 1869 Cincinnati Red Stockings. It was there where he is credited with introducing innovations such as backing up infield plays from the outfield and shifting defensive alignments based on hitters' tendencies. For his contributions as a manager and developer of the game, he was inducted into the Baseball Hall of Fame in 1952 by the Veterans Committee. Wright was also the first to make baseball into a business by paying his players up to seven times the pay of the average working man. Born in Sheffield, England, he was the eldest of five children of professional cricketer Samuel Wright and his wife, Annie Tone Wright. His family emigrated to the U.S. when he was nearly three years old, and his father found work as a bowler, coach, and groundskeeper at the St George's Cricket Club in New York. Harry dropped out of school at age 14 to work for a jewelry manufacturer, and worked at Tiffany's for several years. Both Harry and George, twelve years younger, assisted their father, effectively apprenticing as cricket "club pros". Harry played against the first English cricket team to tour overseas in 1859. Both brothers played baseball for some of the leading clubs during the amateur era of the National Association of Base Ball Players (NABBP). Harry was already twenty-two when the baseball fraternity convened for the first time in 1857, at which time he joined the Knickerbocker Base Ball Club. He did not play in a game with the Knickerbockers until July 8, 1858, playing the outfield against Excelsior of Brooklyn. The Knickerbockers lost the game, 31–13. In 1863, the Knickerbocker club all but withdrew from official competition, and Wright joined Gotham of New York, primarily playing shortstop. Here, he joined his brother George, who had become a member of the team the previous year. During the winter of 1864/65, the Wrights played the curious game of "ice base ball". Wright left New York on March 8, 1865, bound for Cincinnati, where he had been hired on salary at the Union Cricket Club. When baseball boomed less than a year later in 1866, the first full peacetime season, he became, in effect, club pro at the Cincinnati Base Ball Club, although he is commonly called simply a baseball "manager" from that time. By now, Wright was 31, probably past his athletic prime. During this early era, the rules of the sport for many years prohibited substitution during games except by mutual agreement with opponents, and the role of a team manager was not as specifically geared toward game strategy as in the modern era; instead, managers of the period combined the role of a field manager with that of a modern general manager in that they were primarily responsible for signing talented players and forming a versatile roster, as well as establishing a team approach through practice and game fundamentals. In 1869 Wright became the first to make written mention of the Seventh-inning stretch in a game he watched. From an invitation in 1870 by Ivers Whitney Adams, the founder and President of the Boston Red Stockings, Wright moved from managing the "Cincinnati Red Stockings" to work professionally with the first-ever base ball team in Boston, the "Boston Red Stockings". The team was to play in the newly formed National Association of Professional Base Ball Players, now known more often as simply the National Association. The Red Stockings finished third in the NA's inaugural season. Wright, now 36 years old and the second-oldest player in the league, was the team's regular center fielder, playing 30 of the team's 31 games at that position. He also pitched in nine games in relief of Albert Spalding, notching one win. In 1872, the Red Stockings won its first championship, beating the Baltimore Canaries by 7½ games. They won again the next season, finishing four games ahead of the Philadelphia Athletics. 1874 turned out to be Wright's last year as the team's regular center fielder. He had been the oldest player in the NA for three years running. It was also his third straight championship as manager. That year, he organized what turned out to be a fairly disastrous attempt to take baseball back home to the British Isles. In 1875, the final year of the NA, the Red Stockings were an amazing 71-8, finishing a full 15 games ahead of the Athletics. 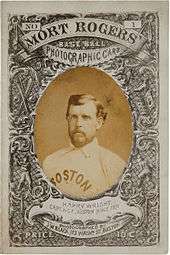 Wright, now the oldest player in the league, continued to play regularly in center field for Boston until 1874. After that, he played in just three more games, one in each of the next three seasons. In 1876, the Boston club joined the new National League. They became the "Red Caps" now, in deference to the resurrected Red Stockings name for the new Cincinnati Club. Although they once again stumbled in their first year in a new league, finishing fourth in 1876, they went on to win two more pennants in the following two seasons with Wright at the helm. The team finished second in 1879, but then slipped badly, finishing sixth in the next two seasons, which wound up being Wright's last two seasons in Boston. After leaving the Red Caps, Wright quickly picked up with the Providence Grays, one of the stronger NL teams of the era. In 1882, his first season as Grays manager, the team finished in second place, just three games behind the powerful Chicago White Stockings led by Cap Anson. The team dropped to third the following year, and Wright moved on again. While in Providence, Wright instituted the concept of a farm team. Wright assembled a team of amateurs, which would play at Messer Street Grounds while the Grays were on the road, with the intention that if one of the senior members was injured, he could be easily replaced from among these players. In 1884, Wright was brought in to manage the Philadelphia Quakers. The Quakers had joined the National League the previous year, finishing dead last with an abysmal record of 17-81. Under Wright, they improved enough to finish in sixth place in 1884. In 1885, the team finished above .500 for the first time, going 56-54 and finishing in third place, a distant 30 games behind the White Stockings and 28 games behind second-place New York Giants. The Quakers continued to improve under Wright in 1886, finishing with a record of 71-43, although their position in the league fell to fourth. In 1887, the team finished in second place, just 3½ games behind the champion Detroit Wolverines. Unfortunately, that was to be the high-water mark of Wright's tenure in Philadelphia, as the team hovered in the middle of the pack, finishing between third and fifth every year from 1888 until 1893 (although he missed a large portion of the 1890 season due to problems with his eyesight). During Wright's tenure in Philadelphia, he often clashed with team owners Al Reach and Colonel John I. Rogers. After the 1893 season, his contract was not renewed. The National League, in recognition of Wright's standing, offered him the position of Chief of Umpires. During his career, Wright had often served as umpire, even for games involving rival teams, due to his high ethical standards. In 23 seasons of managing in the National Association and National League, Wright's teams won six league championships (1872–75, 1877, 1878). They finished second on three other occasions, and never finished lower than sixth. Wright finished his managerial career with 1225 wins and 885 losses for a .581 winning percentage. Wright died of a lung ailment on October 3, 1895 in Atlantic City, New Jersey, He is buried in West Laurel Hill Cemetery, Bala Cynwyd, Pennsylvania. Wright was inducted into the Baseball Hall of Fame in 1953. He was inducted into the Cincinnati Reds Hall of Fame in 2005. His brother George Wright is also a member of both Halls; a third brother, Sam, also played professionally. In July 2009, Hunt Auctions stopped bidding on several lots of 19th-century letters sent to Wright and removed them from the auction. This was in response to an FBI investigation regarding the possibility that they were stolen from the New York Public Library sometime prior to 1986. The library was once in possession of four scrapbooks of letters that had been sent to Wright between 1865 and 1894, but in an assessment of the collection conducted during 1986 and 1987, three of the four volumes were discovered missing. FBI investigators are trying to determine "whether those items were among the items apparently stolen from the public library collection". The lots, over 20 in total, were part of a live auction Hunt Auctions was conducting during the Major League Baseball FanFest on July 14, 2009. Alvarez, Mark (1996). Frederick Ivor-Campbell; et al., eds. 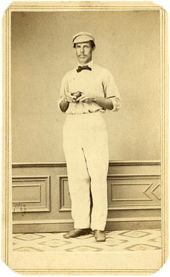 William Henry Wright (Harry): Baseball's First Stars. Cleveland, Ohio: Society for American Baseball Research. ISBN 0-910137-58-7. Devine, Christopher (2003). Harry Wright: The Father of Professional Base Ball. McFarland. ISBN 9780786415618. Reeves, Scott (2014). The Champion Band: The First English Cricket Tour. Chequered Flag Publishing. ISBN 9780956946089. Wright, Marshall (2000). The National Association of Base Ball Players, 1857–1870. Jefferson, North Carolina: McFarland & Company. ISBN 0-7864-0779-4. ↑ "Hunt Stops Bidding on Wright Letters", Sports Collectors Digest, July 31, 2009. Wikimedia Commons has media related to Harry Wright. Retrosheet. "Harry Wright". Retrieved 2006-08-29.